A six year literary account of the making of People Will Talk. It is a general consensus that things in life aren’t black and white. No- we instead often refer to the grey area, that area in the middle, to explain things. We like to say things like “The truth often lies somewhere inbetween” or “There is a happy medium” or “Let’s split the difference”. I understand that to a degree. I suppose in a way we live in a grey world. Calling it grey takes into account all the many variables. I suppose it also gives us breathing room to explain what is often hard to explain or define. So I guess I’m fine with it. My own musical path, and in turn the path of Lickpenny Loafer, was shaped significantly by my Indian heritage. India is the country I was born in and was raised in for the first seven years of my life. Beyond that it is hard to really explain the extent of the relationship that I have with the country of my origin. But what I do know is that for me there is a very deep connection to India. Once in a while you come upon a nice crisp sheet with very clear, legible writing, that’s filed away in an unmarked…well…sometimes a file actually. These types exist few and far between. But once in a blue moon you find them resting neatly in their own cozy space. These are often what become of the few (very few) poems ive ever written. I often clarify many differences between words put together for the express purpose of lyrics and everything else so I won’t get into all the reasons why these pieces of paper are different. But safe to say, I know the difference simply by looking at the condition of the paper and the manner in which they are preserved:) Yep, these tidy and pristine guys are definitely poems. And believe me, it doesn’t mean in positively any way at all that those crumpled up lyrics sheets are valued the slightest bit less- it’s just that’s the world they live in…you know they interact with music…they’re more chaotic…they stop for a drink or a smoke and hang out wherever they feel like it…freakin’ delinquents…you don’t have very much control over them, they seem to do what they want to do. But the poems are so thoughtful and well-behaved. Like English school children dressed up and ready for a Sunday picnic. We do what we must, so we can survive. Meaning aside, i can see why these guys find their own space and not want to hang with the kids from the other side of tracks if you know what I mean. who strung beads into wands. Simple wisdom for a simple folk. Yeah, so these guys are a bit different. But let’s try and make space for everything here…especially flotsam and jetsam. I’m sitting here sipping on a glass of Campo Viejo Crianza wondering if I actually know what I’m doing And part of that is, as a band do we know what WE are doing? ButI’m not interested in making this any kind of serious philosophical discussion. I’m relaxed. I’m enjoying my wine. I just have questions about the day. Questions about tomorrow. Questions about the next several months. To be truthful, I don’t have questions about the next few years – I don’t have time for that. But ‘unsureness’ always creeps in. The more you understand something, the deeper you fall into it, the more layers you uncover, you stare that question right in the face- do you know what you’re doing? Do you know what you’re getting into? Have you thought this through? Are you in control? And ultimately are you happy with it? We’re making lots of decisions and adjustments right now as we find ourselves on the last stretch of preparation before we hit the studio. After a considerably more laborious process than we intended, we’ve selected our studio and are booked in for all our time to do our record. We’re basically at the point where there is no turning back. It’s a funny point where you’ve convinced yourselves that you know what you are doing and that’s when a bit of pressure starts to build. So you have some very real fears that appear on cue and show up for the ride. That’s part of it right? You can’t know everything there is to know about it right? That’s why we rely on each other I guess. One of the best parts of being in a band is the comradery you share with a group of people. Everyone brings something to the table and at the end of the day you build something together. It’s so often that the confidence you have in the others trumps the insecurities you have about yourself, and that’s what motivates you even further to pull your weight. Questions aside and fears aside, it makes sense that we are where we should be. You can’t know everything, you can’t have it all figured out. That’s not the way it works. There are still a few of the songs that we are not at all sure what approach to take for recording. That’s ok. But as I sit here sipping on this glass of Campo Viejo Crianza I can’t help but brace myself just a little This ship has sailed just a little further out to sea and we are acknowledging the personality of the open water. I am always blown away by access these days. So….We’ve been thinking a lot about track selection. There are several songs that are part of our live repertoire which are obvious selections. But…there are others that fall into other categories- they haven’t been tried out live; or maybe, they need to exist as studio songs to find real life. We don’t know. But we’re going through this process right now. Dev and I spent considerable time last weekend on these ‘other’ ones. ‘Which’ of these ‘other’ songs fit in with the album? Which of these will be added to the live repertoire? Most of all, which of these are truly good songs? We don’t know. This is what pre-production is all about. But it is exciting. The process of song selection is so much more about actually playing, feeling, working, and living these songs, than it is picking from an imaginary hat. There’s more thought into this part of the process than we figured- well, partly because we didn’t realize that there were this many to choose from. So, indeed we are somewhat in the process of choosing. But choice is not something you just up and decide. Sometimes you have to gravitate towards it, lean into it, get a sense of it, and work with it. Just like most of the choices in our lives. The more time passes,the more I realize how correct Einstein was. It was Einstein who said, “It is becoming increasingly clear that our technology is surpassing our humanity”. Today, technology isn’t even the driver- it’s just the vehicle. Information is the guy sitting behind the wheel. And no one can seem to get enough of him. And so it is with a sense of total fascination, awe, confusion, and excitement about the world around us, that we announce through our Internet website/blog/facebook/twitter machine the officially the beginning of the recording of our first full-length album. Yes, yes I know, we’ve talked about it for a while, but this time it’s different. The timing is right, the method is there, the studio has been chosen, and the writing is on the wall. So that’s mostly it for reflective sound bites on the matter. Sort of. Well, one more thing. The fact is that this is something Lickpenny Loafer has been building towards for a long time. And any which way you look at it, it falls squarely upon our own shoulders to get this thing done. No one is going to come along and magically make it happen for you. In a sense, you could say “We fought the music industry and the music industry won!” You just can’t waste your days magically hoping for the industry to make your dreams possible. And that’s not because there aren’t good people involved in the industry. There absolutely is, lots of them, doing many important and great things. Especially at the local and regional level. In fact, in Toronto alone, there are so many incredible people who are very dedicated to promoting the oasis of indie music in our special city. It’s the larger side of the industry that’s having a tough time. Look – the infrastructure of the whole f*king thing – the process of discovering bands, recording music, distributing music, playing shows and touring – is standing on its head. And it will still take a while before new models for each of the pieces are established. And it’s likely that the models of the “new” music industry will move even further down the path of being based on grass roots and Do-it-Yourself methodology. It’s a freakin Revolution!! But revolution aside, we don’t have the kind of time to wait any longer. I don’t say that because we are in a rush. In fact, it’s quite the opposite. I think we bade our time very carefully; we have been extremely cautious and calculated about every step and risk. Some might argue too much (but after careful consideration, we would respectfully disagree with them ) No, we don’t have the kind of time to wait, simply because the timing is just right. I liken it to what Sun Tzu preaches in the Art of War- that you must wait for the chosen moment (in the case of war, when all other avenues of peaceful victory are lost) and then strike swiftly, deftly, and convincingly. Recording an album may not be anything like entering the battlefield, but like confrontation, it does subscribe to idea of perfect or close-to perfect timing. And when the moment is chosen, executing must similiarly be swift, effective, and convincing. If you don’t give it the requisite energy or if the process drags out too long, your music suffers. So that’s where it is. We’ll keep you posted. While living in South Africa in 2003/2004, I had the experience of doing some volunteer work for a children’s orphanage in Soweto, a suburb of Johannesburg. The township of Soweto has over 1 million people, and an estimated HIV/AIDS rate of over 40%. The experience proved to be both difficult and inspirational. It was extremely tough to comprehend a situation where children are brought into this world already infected with HIV, abondoned at birth, and in all likelihood would not live to see their 14th birthday. And yet, it was incredibly inspiring to be around them and to have the pleasure of watching them being able to still be the kids they are. What really struck me about these kids was the way in which they treated each other. For one, they shared EVERYTHING. I remember bringing in a box of cookies just as we were about to start a friendly soccer match. I started to hand out the cookies to some of the kids standing close by on our team, and without a moment’s hesitation, one of the kids gently took the box from me, ran over to the other team and distributed cookies. He then made his way back over to our side, and distributed the rest of the cookies till they were all gone. Unfortunately, that means he was left with none for himself but he didn’t seem the least bit concerned and wore quite a radiance about his face. I smiled a sheepish smile; I was terribly embarrassed at myself for not doing what he did first, and blown away by his innate impulse to share so automatically. Sometimes it is the things you notice but cannot explain which impress you the most. These kids had a magic to them. They didn’t attach a sense of entitlement to anything in their lives whether it be food, a roof over their heads, or the chance to play a simple game. I got to know kids that have been through horrors I can’t even begin to imagine, and they still smiled and laughed more than any group of people I’ve ever met. As I watched them in wonder, I felt small and confused about the sense of entitlement the first world had raised me with. The embarrassing feeling I had on the soccer field that day is one I experienced several times over in my time working with them- and one that has since never left me. The other thing that was inspiring was to witness all the hard work that the charity staff were doing to make living for these children as normal as possible and for as long as possible. I learned very quickly how tight the operating budgets were for these orphanages. Funds to cover basic needs including food, clothing, blankets, and toys were always in great need. While on their own these are not great costs, the lack of availability of such funds and the large number of children that need care made every day a challenge. It became very clear quickly that a little bit of help could go a long way. Since returning from South Africa, the idea of doing something for these kids brewed constantly. In the last year, after a more concerted effort and plenty of discussions with several other people looking to help, the idea has came to life. 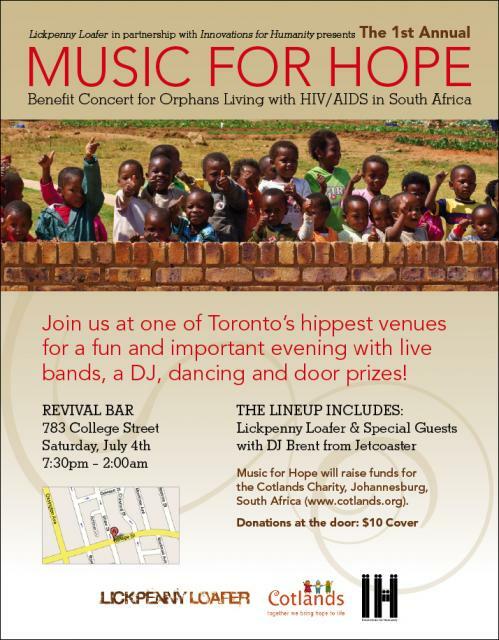 Now in 2009, Lickpenny Loafer has partnered with the Innovations for Humanity network to create the 1st Annual MUSIC FOR HOPE Benefit Concert for orphan children living with HIV/AIDS in South Africa. The benefit concert is being done for the Cotlands Charity based out of Soweto in Johannesburg, SA and as a result all net proceeds from the event will go directly to Cotlands. For more info, please visit www.cotlands.org. We want you to join us for an awesome night of great live music, dancing (a special guest dJ), door prizes, and overall fun that will in turn contribute to a very important cause. MUSIC FOR HOPE is ultimately about doing our part to help others in whatever way possible. I am proud to be Canadian and part of a country that has countless individuals constantly making an effort to raise awareness and funds for the needs of others. Whether it’s climbing the CN tower, doing a 10K run, or putting on a fundraiser, there are so many Canadians who try and do their part. When we do, we find that a little goes a very long way.